So, it’s been said that “there is a fine line between hobby and mental illness” and Beth today extended that to say that there is a fine line between collecting and hoarding. Which is why those of us who collect, often find ourselves in a position of having to explain our hobby or justify to our spouse the next acquisition when there is little to no distinction in their eyes between the next thing, and the five or ten or fifty that you already have. As I told my nephew last week when he was trying to compare a snowmobile to a bike, what distinguishes a collector from someone who just acquires stuff is connoisseurship. A person who collects without a sense of purpose is really just a hoarder, but one who collects with purpose, strategy and an appreciation for the subtle distinctions between two similar things is participating in what is the very definition of culture. When events first became campfire stories, when foods were first blended for flavor rather than consumed solely for sustenance, when cave wall art started to take shape, we began to develop our uniquely human culture. As time and human history have progressed our civil society has been defined and re-defined not just by where and how we live, but by the artifacts of our lives. Any archeologist will tell you that the things we produce, use and collect are, at least in a historical sense, truly the essence of who we are. There are many, many things that interest me but only a small subset of my interests can be explored to a level of knowledge and appreciation that satisfies my desire to understand the essence of the thing. My appreciation of wine is a great example, I know a reasonable amount about wine in general but I know more than most about Italian wines in particular. Because wine is a such a rich and complex set of knowledge and I only have room in my memory for a small amount of it, developing a richer and deeper knowledge in just one area satisfies my need to truly appreciate wine without overwhelming me with too much information and as a bonus my appreciation enriches what I learn about other wines and wine making since much of the skill that it takes to appreciate wine in the first place is universal. Which brings us back to the what created the impetus for this blog….my need to collect, as a means of enriching my appreciation of the mechanical objects that move us from place to place. 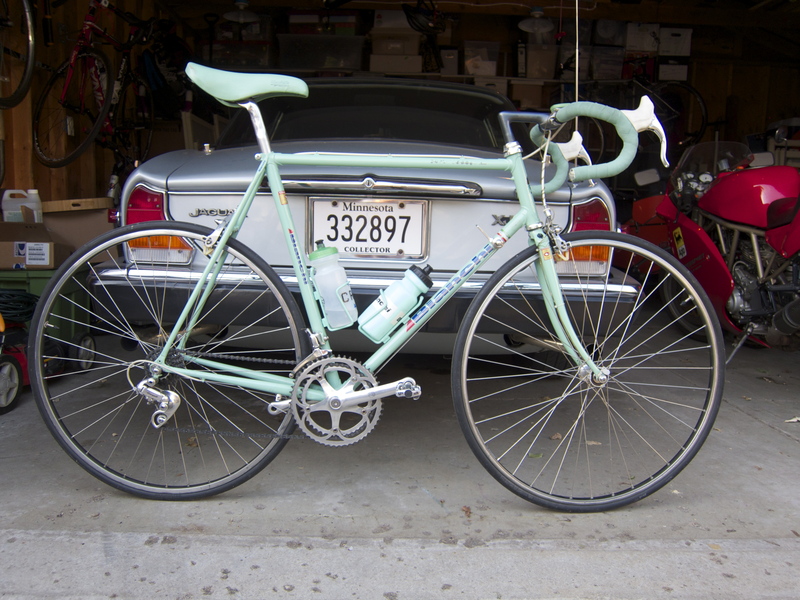 My latest rakish ride is a very lovely and well cared for 1989 Bianchi Super Leggera in that most distinctive of Brand colors, Celeste Green. Although it is not yet properly set up for me my first 20 miles or so this past weekend were a pure joy, and the way in which owning and riding this bike has enriched my knowledge through direct experience is immense. For starters, this is the first all steel racing style road bike I have owned and the ride quality has given me an understanding of why so many cyclists shun the more modern materials of aluminum and carbon fiber in favor of good old steel. The phrase one often hears is “steel is real”. I appreciated this previously by virtue of the fact that all of my mountain bikes have been steel and I have done quite a bit of bone jarring trail riding on them, while my first road bike was aluminum and the feeling that is transmitted to the rider from the road surface through the bike is vastly different. What I did not really appreciate until this past weekend however, was just how significant the type of steel was in determining the feel of the bike. As it is with many things, the Italians have their fusion of art and science well mastered when it comes to steel bikes, and most notably for me the Columbus tubing used to manufacture this Bianchi. I had read descriptions of the unique feel of bikes made with Columbus steel tubing but when I rode one my appreciation of the material became tangible and physically “real”. It was like the first time I tasted Amarone or Brunello wine, in the sense that I knew other wines would from that point forward be held to a higher standard, simply because my frame of reference had been expanded so significantly. It is also worth noting that Columbus steel tubes were also used in the manufacture of Italian cars and motorcycles from the likes of Moto Guzzi and Ferrari. Mountain bikes are made with a relatively thick steel tube so they can handle the rigors of trail riding. A classic road bike like this superleggra however, presents a very different brief to the cycle designer. As the name implies the primary consideration in a road bike like this one is speed and in the famous words of Colin Chapman, in order to achieve speed, a designer must “add lightness”. At the same time a racing bicycle must also be stiff enough to efficiently transfer the riders pedaling energy into forward motion without flexing in a way that absorbs or dilutes the power of their pedal stroke. If however, a bike is too stiff and too light it will not flex enough for the rider to be able to maintain control over bumps or possibly even break under the stress of a bumpy road. Varying the thickness of the wall of the tube, or “butting” the tube is how designers reduce weight while maintaining strength and this “double-butted”, lugged (as opposed to welded) frame is both very light and stiff as well as having what seems at times a magical ability to absorb shock in a way that even my much newer and more sophisticated carbon fiber road bike cannot match. It is not so much how much shock the frame is absorbing that is better but the way in which the shock is absorbed that simply feels better. I have heard others describe it as steel feeling “lively” while carbon fiber feels “dead” and I think that is a pretty fair description, albeit one that has some value judgements implied based on the relative connotations of the words, which I do not necessarily agree with.